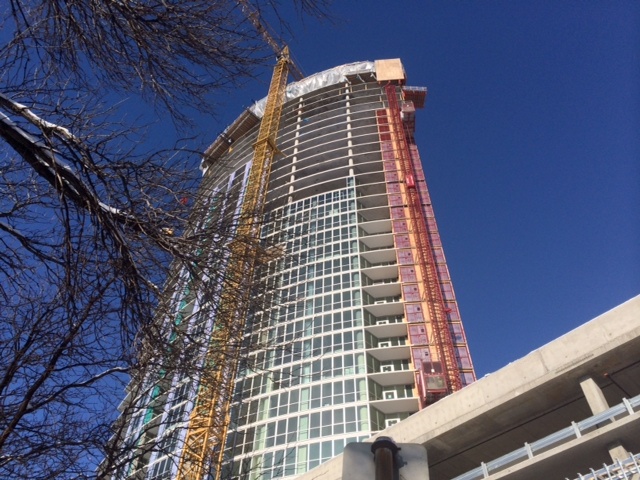 It was a brilliant morning for a topping-out ceremony at LPM Apartments in Loring Park. And cold, of course. The 36-story 354-unit apartment building has reached roughly the halfway mark, with plans to open in early June of 2014. Off-site leasing will begin in January. Developed by Chicago-based Magellan Development Group, the $100 million project spans 583,933 square feet and includes various amenites such as a fitness center, media and game room, resident lounge, business center, bicycle parking, outdoor pool, fire pits and landscaped deck, as well as a private dog run and dog wash.
Janet Moore covers commercial real estate.